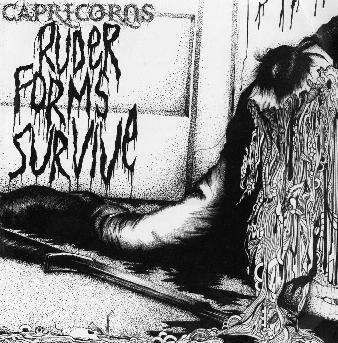 Capricorns - "Ruder Forms Survive"
Capricorns is a new band formed in 2003 by people who play in or have played in Orange Goblin, Iron Monkey, The Dukes of Nothing, Bridge and Tunnel, and others. It is a four piece band who play tuned down heavy riffing rock. No solos, no effects, just simple straight forward heavy riffing and very boring it is. I like the raw sound production but almost nothing happens in most of their songs. It was quite boring and this surprised me as I usually like almost all the Rise Above stuff (where's my sHEavy CD to review Lars??). For more information you can visit the Rise above Records web site at: http://www.riseaboverecords.com.